This was an easier double climb set right after the big holiday weekend. Two hikers joined me for this local backpack and peak climbs. I had attempted one of these peaks twice before, only to run out of time, or turned back by brush and inclement weather. Offering a chance for some fairly local backpacking and camping, I sought to try a new approach to these two peaks. We started from the Indian Creek campground trailhead off the Eagle Lakes Road Exit on I-80. Fortunately, I knew the confusing route from hikes done before. We hiked on 4WD roads, then came in four miles to the Fordyce Creek Bridge. The creek was really running high. We stopped to savor the rushing water, and I shot plenty of pictures. Crossing over the official bridge, we headed up the hill to the trail junction to Beyers Lake. The weather was a bit warm, but we plodded on nonetheless. There are lots of snakes in this area. Arriving to make our camp at one of the Beyers Lakes in mid-afternoon, we decided to climb Black Buttes this day. It was only a fairly brief climb from our base camp. Using bare, open, rock slopes to avoid the brush, we rapidly ascended to the top. The views, back to Beyers Lake and about, were nice, for some photos from the top. We came back to camp, with one backpacker not showing up, having been slow on the approach. He was to have a separate adventure. I knew that he was experienced enough that he would be O.K. by himself. We enjoyed a fine evening preparing dinner and a warmer night at this lower elevation. This small area might make a fine permanent roadless area, but 4WD tracks abound along the edges. Stands of big trees and plenty of granite rock add to the natural beauty that should probably be preserved for some time. 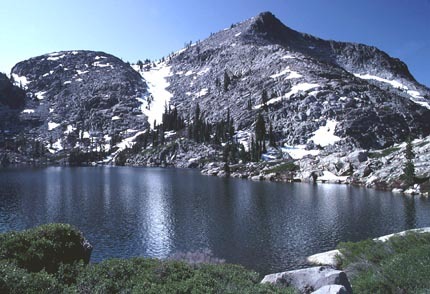 By the registers, many people hike and climb these peaks from 4WD camps at lakes to the north. 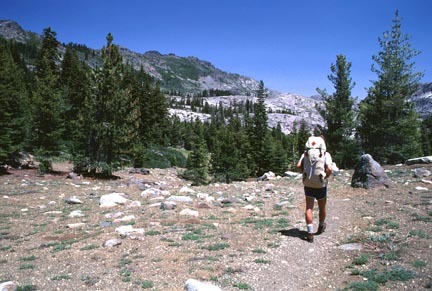 The next day, we headed by trail to Baltimore Lake. This point is accessible by 4WD from the north. There was still some snow. From there, we went south and found a use trail running partway to Phoenix Lake. This is a wild lake that is one of the best lakes around. To my knowledge, I am the only one to ever run a local chapter trip here. Old Man Mountain presents its steep side to the north. Our climb was up these steep granite slabs, then perhaps a short class three section near the summit. I really enjoyed looking down at Phoenix Lake far below. Making the top, we signed in an old register. Wayne took my picture. He went bare topped with shorts for most of the weekend. I wore my synthetic fiber top and long pants, which kept the sun off me. A snow gully led back down to the lake a bit further east of our ascent route. I had a great time making a long standing glissade. We didn't have ice axes, but the snow was soft enough to stop, if we chose to, by kicking into it. Reprising our hike back to Baltimore Lake, we explored cross-country getting back to our camp. Taking the same route back to the finish, we saw a large but non-venomous snake sunning itself on the trail. This is one of the prime habitats for rattlers, but we didn't see any on this trip. Navigating smoothly along the trails and the 4WD roads, we came back to the car and met our third hiker. He had decided to camp by himself and, of course, dispensed without our peak climbs. My priority is to complete the climbs, and some slower and lesser hikers don't like that. I try to give ample warnings for persons signing up that these are hikes "off the scale" by the schedule rating system. Being local Sierra Clubbers, they perhaps are led to falsely believe that they can do anything. We believe in carpooling, so if there is room, we enjoy the company. The L.A. chapter runs bus trips, where hikers are free to do as they please once a destination is reached. I accommodate responsible tag-alongs if they accept the commitment to meet us for the arrival and departure times. I have not yet had a bad problem with this. I had done this myself to secure a ride once, to take a long backpack trip, going one-way with a driver to Yosemite. Certainly there are people with inflated views of their ability. I think most adult persons know that if they travel alone, they are liable for themselves. Nowdays, with cellular phones and radios, some may feel wrongly protected by this connection with civilization. One reads of lost hikers, requiring rescue, who "took their phones or radios but left their brains behind." We don't like those!